If you polled a crowd on what their favorite Indian dishes were, you would probably find butter chicken up at the top. A much-loved Indian dish, it originated in the 1950s in a Delhi restaurant. The rich combination of butter, spices, tomato, and cream makes a velvety sauce that has become a worldwide favorite. The complex flavors come from a variety of spices, which include garam masala, cumin, and coriander. Garlic and ginger add to that flavor and the finishing touch of butter and cream gives the dish its signature texture. While many butter chicken recipes begin with a yogurt and spice marinade for the chicken, this pressure cooker version requires very little prep time. Boneless chicken thighs are used in this dish because of their excellent tender texture, but feel free to make the dish with boneless chicken breasts. Serve this delicious butter chicken with white or brown rice, naan bread, and yogurt, if desired. Put 3 tablespoons of the ghee or butter in the Instant Pot and choose the sauté setting. When the fat is hot, add the onions. Cook, stirring frequently until the onion is softened. Add the garlic and ginger and cook for 1 minute longer. Add the garam masala, turmeric, paprika, kosher salt, coriander, cumin, and cayenne pepper; cook for 1 minute longer. Cancel the sauté setting. Add the chicken stock, then the tomatoes. Layer the boneless chicken thighs on the tomato layer; do not stir. Lock the lid in place and turn the venting knob to the sealing position. Choose the manual setting, high pressure, and set it for 10 minutes. When the time is up, let the pressure release naturally for 15 minutes. Carefully release the remaining pressure and remove the Instant Pot lid. Remove the chicken thighs to a cutting board and set aside. Purée the sauce with an immersion blender. Add the tomato paste and set the pot on the low sauté setting. Cook for about 3 to 5 minutes, or until the sauce is reduced slightly and thickened as desired. Stir in the remaining 3 tablespoons of butter and cream. Cut the chicken thighs into bite-size pieces and return the pieces to the pot. Cook until hot. Stir in half of the chopped cilantro. 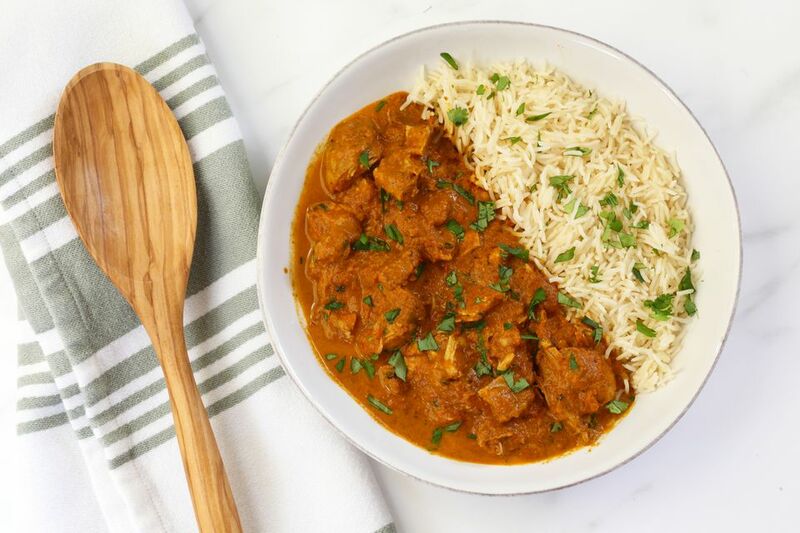 Serve the butter chicken with hot cooked rice and garnish with the remaining cilantro. The pressure cooker relies on a certain amount of liquid to produce the steam necessary to come to pressure. It's for this reason that 1/3 cup of chicken stock is added to the bottom of the pot. If you stir the stock and tomatoes together, the mixture could become too thick to come to pressure. Even though it is called butter chicken, many cooks make it with vegetable oil or coconut oil. Feel free to swap out part or all of the butter with cooking oil.